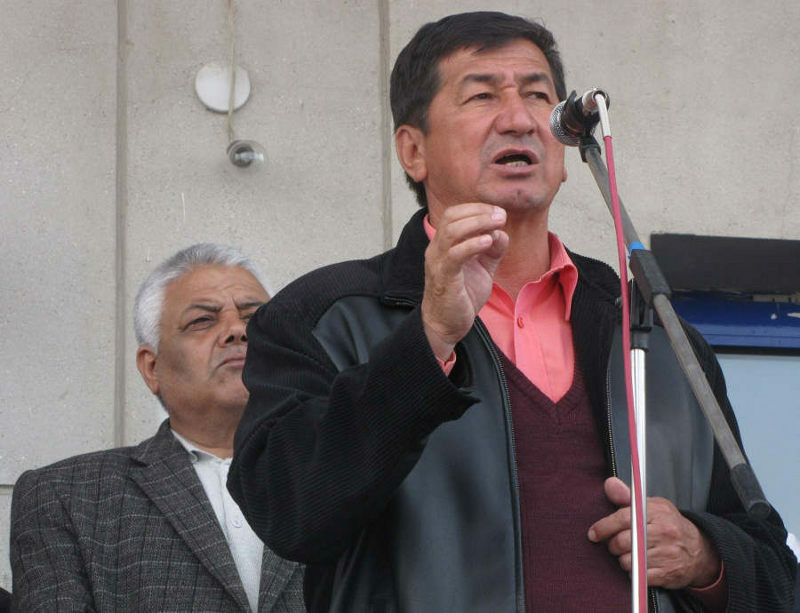 Kadyrzhan Batyrov, one of the leaders of Uzbek community in Kyrgyzstan, the founder and president of private university in Jalal-Abad, former parliamentary deputy and state advisor of second rank, became the major person involved in June tragedy in southern Kyrgyzstan. Both national and independent commissions as well as certain politicians refer to Batyrov as one of the main causers of interethnic clashes and victims. After being silent and in exile, Kadyrzhan Batyrov agreed to give us exclusive interview. - Mr. Batyrov, where are you at the moment? - I cannot say where I am so that this country is not blamed in hostile attitude against Kyrgyzstan. In fact, I can be located in any CIS country and outside because these countries well understand the situation in Kyrgyzstan. In Kyrgyzstan the authorities turned things upside down and turned victims into offenders. - Are you aware of the criminal case, filed against you in Kyrgyzstan? Did the border or law enforcement structures try to detain you at crossing the borders? - I know nothing about criminal case. I can assume they tell fairy tales in order to blacken "bad" Uzbek leaders, including me. - Why did not you give a single interview to Russian, European or Kyrgyz editions? - On one hand, I had to think and reconsider what happened in the republic. On the other hand, my statements could deteriorate the situation and damage Uzbek people and those, who regardless of ethnic identity, believed that after overthrowing Bakiev’s regime Kyrgyzstan would enjoy equality of rights and law-based state. Kyrgyz authorities launched strong information campaign about Uzbek "separatism" and Kadyrzhan Batyrov as main "separator". Any of my statements could be given the desired political interpretation, beneficial for Bakiev and those, ruling in the government and the parliament. The same can be mentioned in relation to criminal groups that feel themselves free [in the republic]. This could complicate things for common people. - When and why did you leave Kyrgyzstan? Was it due to personal security or other reasons? – I had to leave the country by the imperative request of Ismail Isakov, the special representative of interim government in the south, and Baktybek Alymbekov, at that time the commandant of the Jalal-Abad Oblast. They motivated it by the fact that they needed 3-4 days in order to prevent seeing Kyrgyz population joining the team of Kurmanbek Bakiev. For some reason this fact is not publicly shared by interim government people although at the same time they mentioned I left the republic with the help of "some interim government representatives". Since I left the republic by their request in order to preserve peace in the country and up until the start of June riots the interim government members palmed me off with promises that fabricated charges against me will be called out and I would be able to return home. This did not happen. 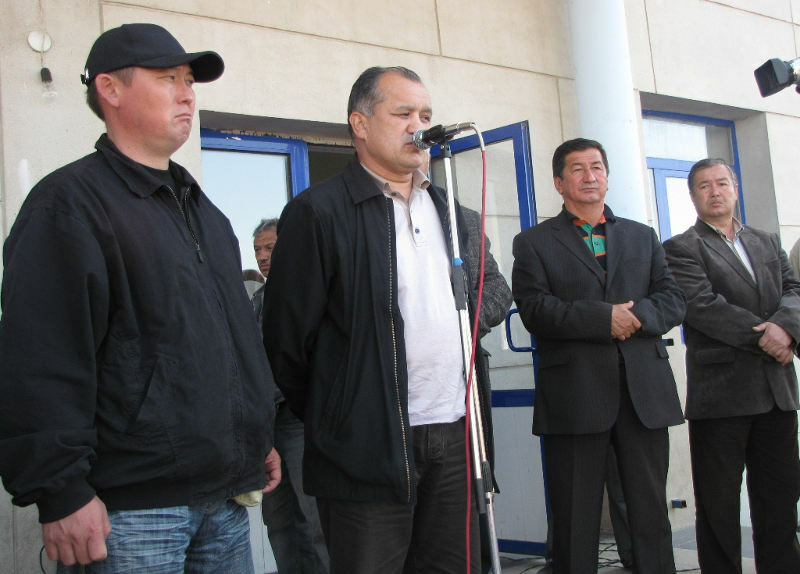 The protest in Jalal-Abad, April 10, 2010, from L to R: Bektur Asanov, Asan Shakirov (the protégé of Bakievs, governed the oblast before B. Asanov) acting head of oblast internal affairs department (that served only few days), Giyasov (at that time the deputy governor) and Kadyrzhan Batyrov. - The internet comments often times mention that the portrait of Uzbek President Islam Karimov was posted in your office. Is this true? - This is nonsense in the series of absurd blames. I never had the portraits of the president. I had the portrait of my father and his bust on my table. - The report of National commission says that first Kyrgyz President Askar Akaev "used the ethnic minority leaders and their cultural centers for his own political purposes during the elections and referendums". Is it true that in 2005 you were put in opposition with Kurmanbek Bakiev in order to produce tensions in Kyrgyz-Uzbek ethnic relations? - I have to give a credit to Mr. Erkebaev, the head of National commission: despite the absurd nature of most the committee conclusions he admitted there was no Uzbek separatism. Our work as Uzbek community leaders was to run negotiations, make some steps to promote Uzbek rights in compliance with laws. Our goal was to make Uzbek feel as rightful citizens, study, work and grow kids. - National commission names you as one of the most active provokers in riots. You are accused of organizing Uzbek meetings and traveling throughout Uzbek communities. Allegedly, you set Kyrgyz and Uzbeks against each other. If so, how did you do it? - Where is it written I cannot travel throughout the country? Why are not we allowed to have meetings? In this sense, the commission’s report reflects the will of those who do not want to see Uzbeks educated, strong and free. I hope that international investigation will produce unbiased report. If no – we will try to fill these gaps. We have enough evidences in our support. - What did you tell on TV programs, shown in May, and that allegedly irritated Kyrgyz? Can you present the video for publication in mass media and public analysis? – Can you as a journalist believe that two TV channels showed the content, prohibited by law, meaning setting Kyrgyz and Uzbeks against each other? Even if Kyrgyz had been irritated with my statements this was the result of anti-Uzbek and anti-Batyrov propaganda, launched by local politicians. - You said you want to struggle for rights of Uzbeks in Kyrgyzstan. Which rights? - We want Uzbeks to have access to high-quality education, work and get involved in the public life. Since independence the number of schools with Uzbek language of instruction dropped by twice whereas the Uzbek population is constantly growing. Uzbeks were "moved out" from state structures and especially law enforcement system. This is also mentioned in the report of the state committee. Police, the office of Public Prosecutor and other structures prosecuted mainly Uzbeks and demanded money from them. They say Uzbeks do not serve in army. Which parent wants to send his son to army with flourishing nationalism? In the last few years the authorities have been trying to shut down Uzbek TV channels and newspapers. After June riots they got OshTV through corporate raid; other channels are afraid to operate. This is a good excuse of politicians. They can blame Uzbeks, Russians and others in order to give away their own responsibility. Our foreign debt is about $2.6 billion. The politicians and certain people, I am not talking about the nation in general, expropriate other’s property, they do not want to pay for gas, electricity. They do not pay taxes and resist paying back loans. In the last twenty years the government failed to train people to work and pay bills because they do not do it themselves. Those, who want to transparently run business, face corruption, criminals and high taxes. - Was there any "pro-Uzbek" person in the interim government? Someone, who understands your need on granting the official status to Uzbek language, proportional representation in government? - "Pro-Uzbek" politicians never existed. We have had friends from business and politicians with unbiased opinion on things. Many people raise our concerns. However, when it comes to certain steps we have troubles here. Even the relatives fight against each other for power. The bad thing is that the power in the republic is viewed as the source of personal enrichment and guaranteed wealth of relatives. 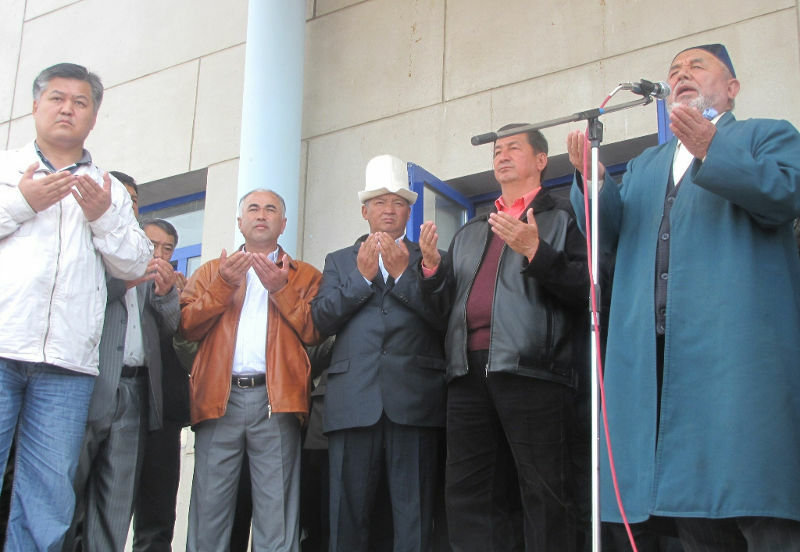 The protest in Jalal-Abad on April 10, 2010, the rightmost: imam Mukhammadzhan azhy, blamed in organization of riots; the investigation is in progress. - According to national commission, the June riots were planned in advance because SOS signs were put in order to warn Uzbek military or Islamists and "extremists were planning the military actions" because there were few military-type KamAZ trucks in the Uzbek districts. What can you say about this? - I would like to thank people of Uzbekistan and government that provided significant support to many thousands of Uzbek refugees, escaping from vicious genocide, initiated by Kyrgyz Nazi. If your house is attacked by APCs, killing children and women, what would you do? Police and criminals acted together. This is why people had to build barricades and use vehicles as protection. We never counted on help from Uzbekistan. Uzbekistan believed that domestic problems must have been resolved within the legal framework and this is right position. If Uzbekistan wanted to unite all Uzbeks of the world then we could expect separatism. Uzbeks of Kyrgyzstan view the republic as home and they want to live in Kyrgyzstan. Therefore, they must articulate rights because they pay taxes to state budget, funding the government and police! According to publication at Gezitter.kg, the Teyit village residents said that Batyrov ordered to burn the houses of Bakiev’s family. They say K. Batyrov, A. Tekebaev (the leader of Ata-Meken party local office) and B. Asanov (the governor of the Jalal-Abad Oblast) joined efforts. Therefore, the Teyit village dwellers refute the statement of national commission, indicating that burning of Bakiev’s houses instigated the interethnic conflict. - So how were the houses of Bakiev’s family attacked in the Teyit village? Is Omurbek Tekebaev, of the deputy heads of interim government, was interested in it? Did he push your people to do it? - When we arrived in Teyit there were special task forces while Bakiev’s houses were already burned. The Teyit village is mainly populated by the relatives of Bakiev that supported him from the beginning to end. Many thousand men that came to small village of Teyit wanted to take the criminal teammates of Bakiev, not intending to harm Kyrgyz, residing in the village; this is why not a single Kyrgyz house there was damaged. - Were you involved in burning Kyrgyz national flag? Did you see it burning? How did the flag end up in the Teyit village? - I did not see the flag there. This is another untrue story. This is the part of nationalistic policy. - The National commission statement indicates that in May you joined up with Ata-Meken against Bakievs. Why Ata-Meken? What were agreements with Tekebaev? – On May 13-14 the oblasts administrations in Osh, Jalal-Abad and Batken regions were taken over. I kept in touch with Ata-Meken leader Omurbek Tekebaev and other members of interim government. We had the common goal: this was not the problem of Ata-Meken and Uzbeks, but people of Kyrgyzstan – to support the revolution. On May 13 I was invited to Osh where over 10 thousand ethnic Uzbeks gathered for the meeting. Despite provocations, urging to take over administrative buildings, I convinced them to go home as we were expecting the moves from law enforcement structures. On May 14 we decided to join the interim government forces. On that day not three Kyrgyz were killed in Jalal-Abad, as Mr. Tashiev says, but two Kyrgyz and two Uzbeks. 80 wounded persons were Uzbeks. As a result of this policy, those who helped the interim government are in exile, while those who supported Bakiev remain in power. - Some sources report that refugee camps in Uzbekistan were prepared several days before the start of riots. Do you know anything about it? - And is this the reason why some National commission members proposed to nominate Uzbek President for Noble prize? Do you not see the absurd nature of these statements? - The report of Kyrgyz Ombudsman Tursunbek Akun notes that you wanted to attach southern oblasts of Kyrgyzstan to Uzbekistan. What is your opinion on that? – As far as I know he said the opposite, meaning we wanted to govern Uzbekistan as the part of the Jalal-Abad oblast. He forgets that the Ombudsman must protect the rights of common citizens regardless of ethnic identity, but not governmental interests. - Some Kyrgyz mass media refer to conspiracy theories with regards to Osh events. Did third forces get involved in Osh riots? - The easiest thing is to blame others. Even if it was so it was the duty of special services to prevent the intervention. Why do they hide the fact that Bakiev’s team hired soldiers of fortune and there were forces that pushed Kyrgyz against Uzbeks? Their main objective is to avoid the responsibility and blame Uzbeks in separatism and third forces interference. Therefore, this is not the question for me, but for the governing people. - Why do you think so? Uzbeks started firing from sporting guns after being attacked by APCs. - You said earlier that Uzbeks were oppressed under Bakiev and after April, 2010 the property of Uzbek businessmen became the target of corporate raid. Can you confirm that? Do you have evidences? – In 2006 Bakiev’s people organized the takeover of the apartment building belonging to our university. They also seized cattle factory of OJSC Dustlik and clinker plant. They built houses on expropriated land. So far not a single criminal case was filed on these matters. I am surprised that some members of interim government and governor Asanov stubbornly deny our meetings. What is so criminal about?! These were official meetings in the office rooms of these people! At first they asked us to help them and then they just left us. They are afraid of nationalists that launched anti-Uzbek campaign. During the meetings we discussed the situation in the republic and the future role of Uzbek community. We decided to stay together. Our meetings were attended by governor Asanov and Asylbek Tekebaev. They thanked us for non-aggressive actions. - Do you think it is strange that the murder of Black Aibek (your enemy) coincided with your negotiations with interim government? - I do not think his murder is a strange event. He was rushing to see his death. - Who do you think was the main organizer of June riots? - Those, who were interested in this. Those, who were losing power and tried to get back the authority. Those, who did not want to see Uzbeks in power. Those, to whom Uzbek businessmen did not pay tolls. And those, who were afraid of organized Uzbek forces. - You blamed General Isakov that prior to the tragedy he personally instructed his subordinates to give out 800 machine guns to the residents of Alay district in order "to kill wolves". Do you have evidences? You also said that Isakov threatened to bring 500 armed cavaliers from Alay to "stabilize the situation". Where did he talk about this? Do you have witnesses? What do you think of the role of General Isakov in June riots? – Having big power of interim government special representative in the south, Mr. Isakov is fully responsible for what happened in the south, especially with regards to Osh mayor Melis Myrzakmatov and deputy interior minister Suyun Omurzakov. Viewing the organizers of criminal structures, drug lords and close teammates of Bakiev as the patriots of Kyrgyz nation he allowed them to stay in power. Unfortunately, we cannot prove some obvious things. - Can you personally comment on actions of other interim government members and their involvement in June riots (Otunbaeva, Atambaev, Beknazarov, his son, Baibolov, Myrzakmatov, Bektur Asanov and other)? - New government proved its weak organization. They say they managed to stop the massacre in four days. I should say that pogroms were stopped only because they were organized on one side and their criminal leaders instructed to stop the massacre. The involvement of heads of law enforcement bodies in these events is so obvious that it was reported by National commission. It does not make sense to give names because these people are in power and they decide who is guilty and who is not. - What can you say about the case of Azimzhan Askarov? - He is one of those who suffered for telling truth. - What is your evaluation of media coverage (including our agency) of June events? Many people in Kyrgyzstan blame media in "prepossession". - When you covered the cases of Gourevitch and Bakievs the current leaders and politicians respected you. When you started telling the truth about June riots you were not favored. In April we [Uzbeks] found ourselves in isolation. In best cases most Kyrgyz media ignored us. Thanks to some media and journalists false propaganda about Uzbek separatism and nationalism of Batyrov reached its goals. Many Kyrgyz language newspapers openly reported nationalistic ideas, inciting interethnic hatred. The office of Public Prosecutor ignored them, but they found so many provocative details in the article of Ulugbek Abdusalamov. Somebody wanted to kill him, but he luckily escaped from the republic. - The National commission report mentions the demoralization of law enforcement structures after April events. What do you say about their role in June riots? - After the revolution the law enforcement structures (especially in the south) were on Bakiev’s side. When common people attacked the building of the Jalal-Abad oblast administration, police, national security officers and army stood aside, openly demonstrating their position. 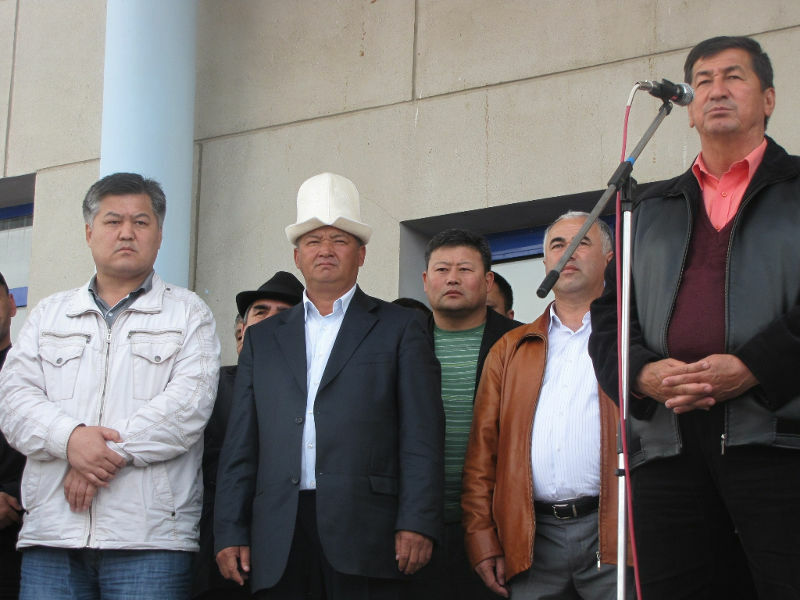 When the crowd arrived in the Teyit village it faced Suyun Omurzakov, the deputy interior minister for southern Kyrgyzstan and head of oblast internal affairs department that stood there to protect the house of Kurmanbek Bakiev. However, after these events Uzbek part of population and their leaders, which had participated in taking over the building of oblast administration, became the criminals while those, who had protected Bakiev’s regime, became heroes. These are the double standards we face in Kyrgyzstan. On one hand the actions of law enforcement structures were the sign of demoralization, but on the other hand, it was reliable weapon. On May 19, Mr. Isakov instructed the special task forces to let the crowd of criminals to devastate the university building. When our people resisted they killed two of our men. Why are not such signs of nationalism reported by National commission? On June 11-14, 2010 APCs with armed Kyrgyz men in soldiers and police uniform were shooting Uzbek civilians. Why did they allow the crowd to take over weapons and APCs in Jalal-Abad when it already took place in Osh? Why do not those, who authorized the distribution of weapons, bear the responsibility? Unfortunately, today, those civilians of Uzbek districts that protected themselves and their families from police, military, criminals are considered as criminals. - Did you have contacts with representatives of Uzbek authorities or law enforcement structures before and after June riots? - Did you meet the experts of international commission, headed by Kimmo Kilyunen? Will they use your testimonies? Do you trust this commission? How their conclusions can influence the situation? – Yes, I met them. We discussed the reasons of June tragedy in detail. I have no reasons not to trust them. Trust me, these events are not the result of 3-4 Uzbek meetings. The ground for massacre has been prepared by Nazi ideologists for years. 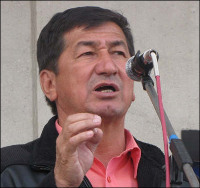 Bakiev’s virus of national exclusiveness and antipathy towards other ethnicities has been set in minds of Kyrgyz youth. It produced the image of Uzbek-enemy as the reason of poverty, Kyrgyz people live in. Thanks to the influence of proponents of Kyrgyz chauvinism Kyrgyz society gained nationalistic ideas. What happened in June is "the merit" of people I already mentioned. Ismail Isakov established, trained and armed the squad. In June there were no takeovers of the arsenals, as it presented by the organizers; it was de facto the distribution of weapons. The evidence is the instruction of Azimbek Beknazarov to the internal affairs department in Nooken and Mayluusu military unit to give out weapons to the criminal squad, headed by his son. He openly shared this story on national television. They want to blame us. I have been heading the Jalal-Abad Oblast Uzbek national and cultural center since first days of independence. The Center always called for law-abiding and tolerance. Having disastrous experience of 1990 we have been calling people for peace and compliance with laws. Thanks to patience of Uzbeks and tolerance of most part of Kyrgyz their centuries-long links have survived through 1990. This stability was destroyed by Bakiev’s regime that split not only two ethnicities, but also Uzbeks through establishing the alternative cultural centers. The problems of Uzbeks have been accumulating for years. We raised them both during Akaev’s and Bakiev’s rule. Most of part of Kyrgyz population showed understanding to these issues. – I absolutely agree. Remaining in power, these people continued building destructive and nationalistic plans. They are in power now. If the organizers are not punished nobody can guarantee they will not continue their crimes against other ethnic minorities.